Friday 15: Music bands parading through the streets at 10.30; Spectacular entrane of the moors at 8.30pm; Music from midnight. 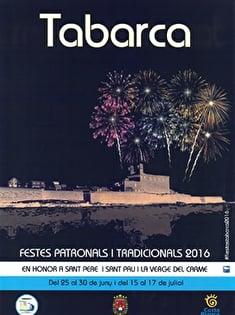 Saturday 16: Food including sardines in the Plaza Gran at 12.30; maritime procession with the Virgen del Carmen, the patron saint of fishermen, at 8.30pm followed by fantastic fireworks; Music at midnight. Sunday 17: Games and children's activities at 8pm following by the grand finale at midnight.